Mod Carousel & Can Can Present: A Benefit to Honor the Life of Sakara Dunlap. Celebrate the life of a beloved member of Seattle's performance community. 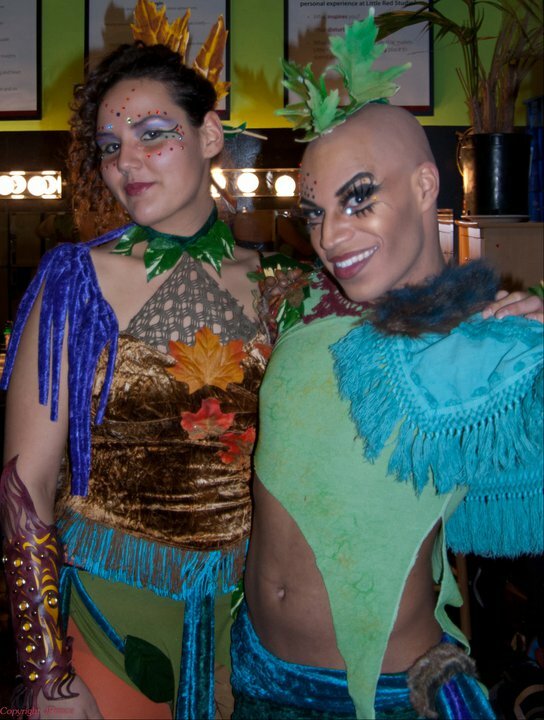 This Wednesday, May 11 at Can Can, friends and fellow artists will honor the life of Sakara Dunlap (Righteous Depravity), member of Mod Carousel and a beloved friend to many in Seattle’s burlesque community. Sakara passed away suddenly on April 5 at age 22, just as she was beginning to bloom as a confident, spirited performer and young woman. Her life was made rich with friends and her passion for performing in Seattle as well as in Juneau, where she graduated in 2007. My best friend, Sakara (Righteous Depravity) was a bold, energetic, charismatic, altruistic person. Sakara’s bold laugh will forever resonate in the hearts of the many people she touched. 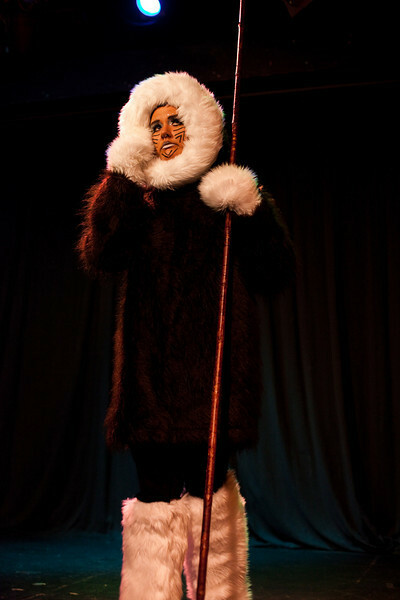 She was passionate about environmental subjects, which showed in her theatrical work. She was like a sponge for information. I was always in awe of the way she soaked it all in, synthesized it, and artistically put it back out. She was studying to become a licensed massage therapist. She loved to climb high things without regard to gravity. I will never forget her thunderous laugh. She was so full of joy. She was the most alive person I knew. She was all about life experiences and taking risks. She hitch-hiked back and forth across the country, and rode her bicycle from Alaska to Seattle making friends and genuine connections along the way. That’s who she was. A genuine bright soul. She was like a second sun. Bright, cheery, and glowing. 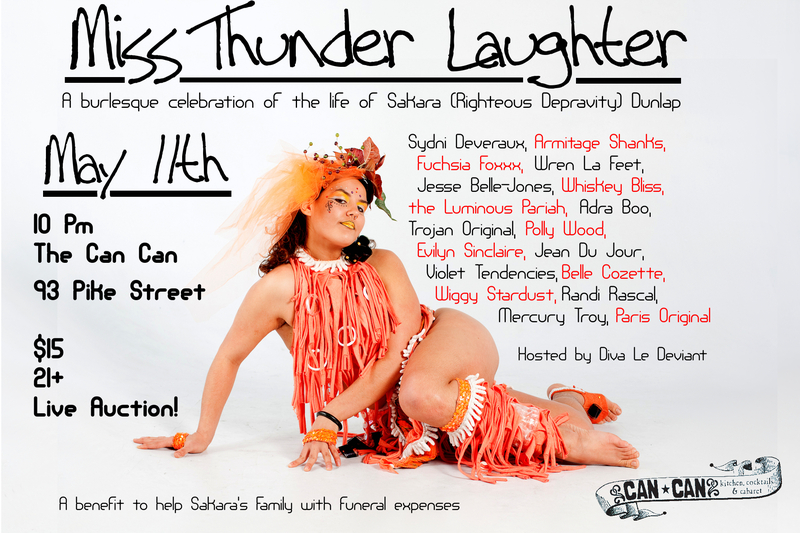 Miss Thunder Laughter– A burlesque celebration of the life of Sakara (Righteous Depravity) Dunlap. This performance is a fund-raiser to help Sakara’s family offset funeral expenses. Other donations can be made to the Sakara Dunlap Memorial Fund at any Wells Fargo. Wear something bright, and fun and come celebrate life with us! 10pm, $15 suggested donation at the door, 21+. Sakara Dunlap (Righteous Depravity)- photo credit pending. ~ by angrytruffle on 05/08/2011.